This Iron Body training set is used to kickstart the internal iron development of all Clear’s Silat students. Q. How much practice time do I need? Q. How long will it take to develop my Iron Body. A. That depends on how hard and consistently you train and how much previous development and experience you have. Clear’s Silat students usually begin to see noticeable development in 1 – 2 months. Q. Are there any special diet, qigong or abstinence required with this practice? A. You will learn a Bone Marrow Washing method on this dvd that must be practice along with this Iron Body Method. For best results you will need to eat a healthy diet, get plenty of rest and keep your vices to a minimum. Q. Does this method need equipment such as iron/bamboo/mung bean beaters or similar stuff? A. The Kuntao Silat method is internal. There is no equipment needed. Q. Does the method covers all the body? A. Yes, it covers the whole body from head to toe. What’s the difference between the Internal Iron in 100 Days DVD and the new Kuntao Silat Iron Body DVD? Q. Which Internal Iron Body is better? Tai Chi or Kuntao Silat? 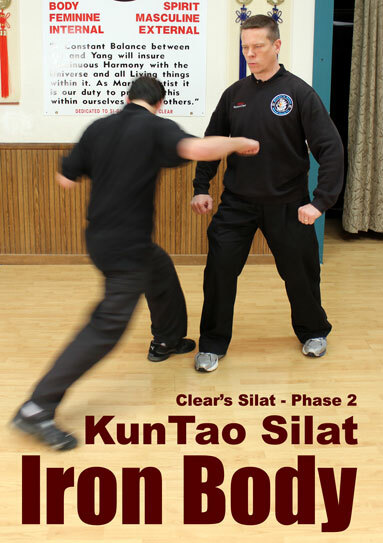 The Kuntao Silat Iron Body DVD is an internal Kuntao Method. If you’re focused only on Tai Chi then stick with the Tai Chi one. ….or you want to increase the pace of your Internal Iron development then get the Kuntao Silat one as well. Our Kuntao Silat students learn the Kuntao one first and train it for several years before they build on top of it with other methods including the Tai Chi one. The Kuntao Silat method is faster and a little less common while the Tai Chi one is slower but more advance and more internal. If you are over 45 years old you’ll want to transition to the Tai Chi method exclusively at some point. However you will accelerate your Iron development quite a bit if you build a base with the kuntao method for a year or so first. Q. Can I combine the Tai Chi method (Internal Iron Body in 100 days) and the Kuntao Silat method? A. Yes, you can combine both methods. If you already have good development with the Tai Chi method and want to add something then learn the Kuntao method and do both at the same time. The primary mechanism at work in the Kuntao method is the spiral which is used in all the internal arts as well. If you haven’t trained either method start with one train it long enough to fully understand the method and get some decent development and then add the other method to it.